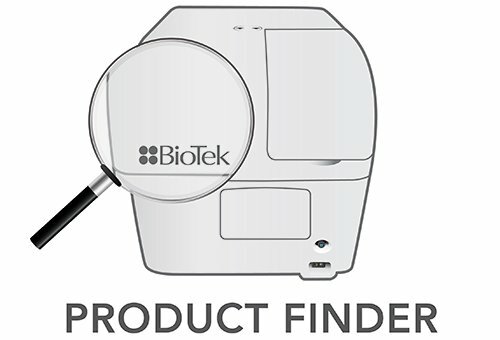 Enzyme-linked immunospot (ELISPOT) assays are a flexible and powerful tool for investigating secreted molecules from whole cells, particularly for analyzing the immunological functions and responses of peripheral and lymphoid white blood cells. 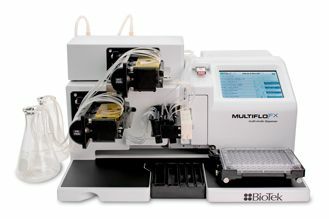 The ELISPOT assay can provide information regarding secreted molecules that other techniques cannot. Monocytes, a key regulator of the immune response, are a good example of a secretory cell . 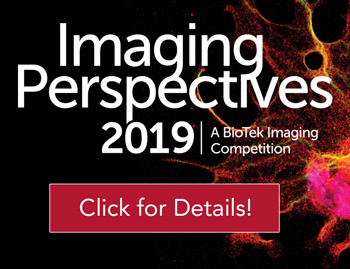 These cells act as scavengers of invading microorganisms and secretors of immunoregulatory cytokines. There are a number of different means in which cytokines can be measured, each with advantages and disadvantages. Enzyme-linked immunosorbent assays (ELISA) are mostly used to measure cytokines in body fluids, such as serum or plasma. 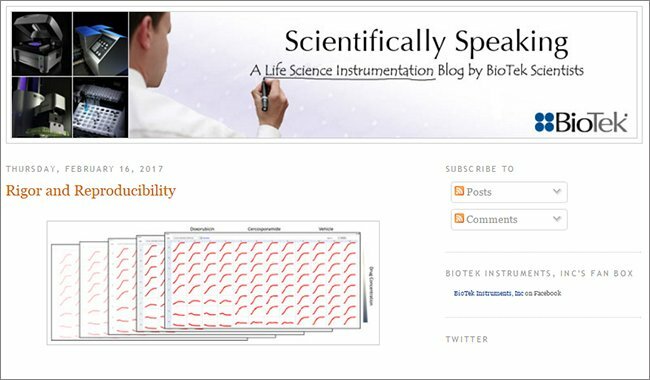 While ELISA will measure secreted cytokine, binding proteins, rapid turn over, and detection difficulties can limit their effectiveness. 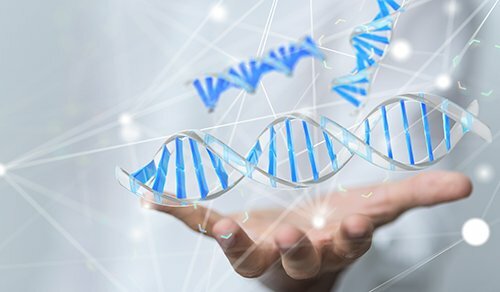 In situ-hybridization and reverse transcription-PCR measure cytokine mRNA expression, which may or may not reflect true cytokine protein levels. 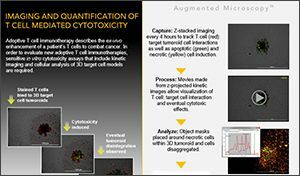 Flow cytometry can provide information about synthesized cytokine, but may not be able to provide information on true secretion and has difficulties with molecules expressed by a very low percentage of cells. 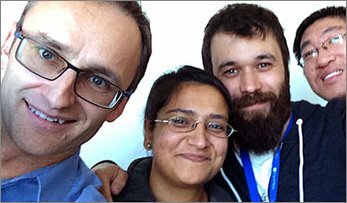 ELISPOT assays permit the identification of actively secreting cells from a mixed population. 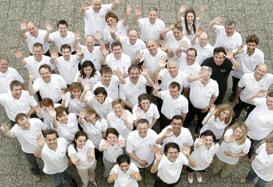 It has been reported that ELISPOT can detect a single secreting cell out of a million total . 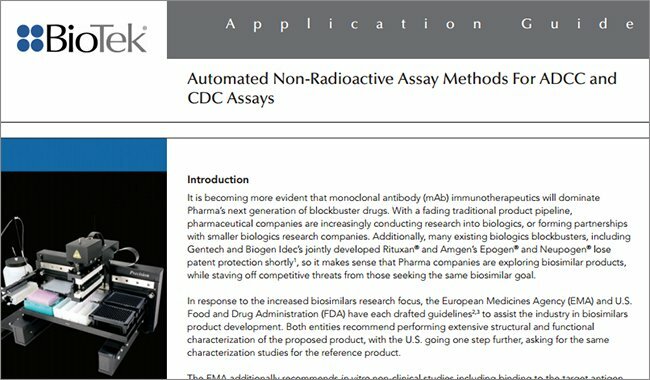 The ELISPOT assay procedure is very similar to that of a conventional ELISA. The plates/membrane are first coated with the appropriate concentration of capture antibody and allowed to absorb. The unbound antibody is aspirated and the plate is washed. Each well is then filled with a blocking solution and allowed to incubate for 2 hours at room temperature. 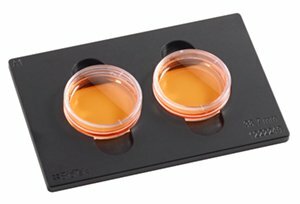 Note that specific kits of ELISPOT plates can be used that are provided from the manufacturer pre-coated with capture antibody as well as blocked to prevent non-specific protein binding. 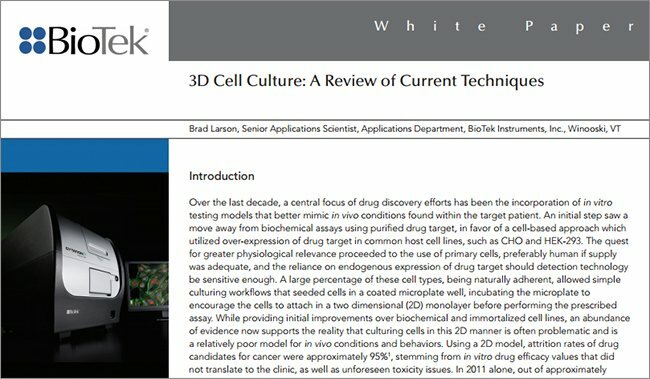 Cultured secreting cells are added to the wells along with any experimental mitogen or antigen of interest. Cells are maintained for a period of 24-48 hours after which they are removed by washing. Analyte remains bound to the capture antibodies in close proximity to the location on the membrane where the cell that secreted the analyte was situated. Figure 1. ELISPOT Assay Procedure. After removal of the cells and any unbound materials, a biotinylated detection antibody is added to the well and allowed to incubate. Excess detection antibody is removed by washing and a streptavidin-horseradish peroxidase conjugate is added. Again, unbound conjugate is removed by washing and substrate specific for the enzyme conjugate is then added and color is allowed to develop. The resultant spots are then analyzed/counted manually or with an automated analyzer (See Figure 1). 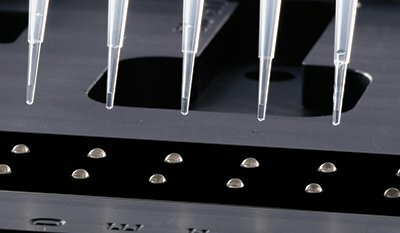 The ELISPOT assay technique has been derived from the sandwich enzyme-linked immunosorbent assay (ELISA) to accommodate the use of whole cells, as well as to provide a means to identify the location and frequency of the secreting cells. This is usually accomplished by using a polyvinylidine difluoride (PVDF) membrane rather than a solid polystyrene substrate to immobilize the capture antibodies. The resultant colored spots are then enumerated by either a manual process or in a high throughput image analysis process. 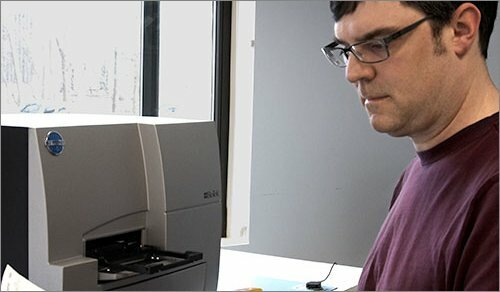 While the analysis of the resultant spots has been automated through the use of an ELISPOT reader (CTL Analyzers LLC), the wash steps inherent in the assay have usually been accomplished manually. 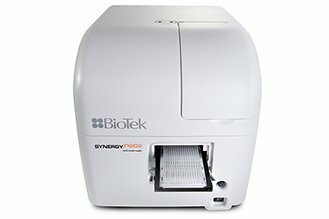 In this treatise, Interferon-Γ (IFN-Γ) secretion by peripheral blood mononuclear cells (PBMCs) is monitored using ELISPOT assay methodology to assess the performance of the ELx405™ Microplate Washer. IFN-Γ is a 14-18 kD, 143 amino acid glycosylated protein that is a potent multifunctional cytokine. It is a type II or immune interferon that is secreted primarily by T (CD8+) cells and NK cells. IFN-g secretion from T-cells can be stimulated by the mitogen phytohemagglutinin (PHA). 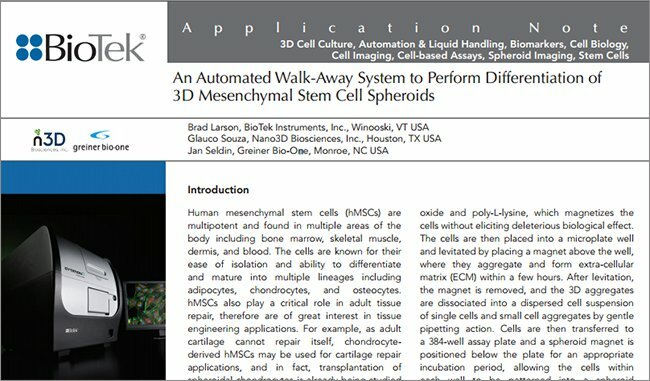 As such, a comparison of the results obtained with a manual wash procedure and the use of the ELx405 automated 96-well microplate washer for ELISPOT would be an ideal way to demonstrate the utility of the automated method. 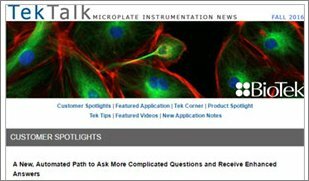 Here we describe the use of the ELx405™ Microplate Washer to perform the wash steps required by the assay procedure. 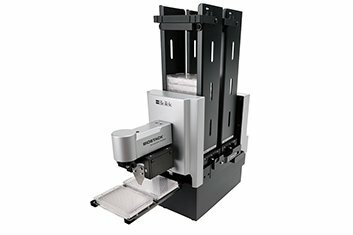 The ELx405™ Select is a multifunctional microplate washer that can wash both 96- and 384-well microplates without any mechanical changes required. The dispense and aspiration manifolds are placed into two physically different parts that are arranged on top of each other. The lower manifold (dispense) is constructed in such a manner as to allow the tubes from the above manifold (aspiration) to pass through and enter the well of the microplate. In order for the dispense tube to be able to dispense fluid into a small well while the aspirate tube is removing fluid from the same well, as is the situation when overflow and bottom washing is performed, the dispense pipe is tilted from vertical. This allows for the dispense tubes to be offset from the center of the well, providing room for the aspiration tubes, yet still allowing the fluid jet to enter the well from the side. This canted design also has the added benefit of providing a swirling motion of the fluid that results in a more vigorous wash. 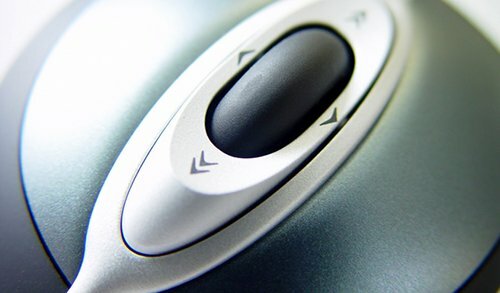 The ELx405 washer can be programmed directly from its keypad on the washer with full functionality. 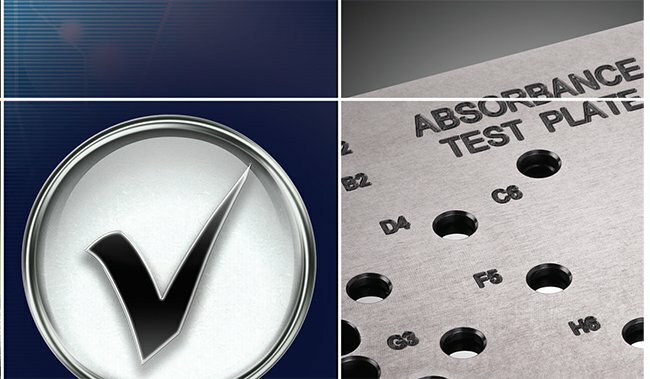 Assay libraries containing as many as 75 different assays can be stored on the washer. The ability to link different wash, prime, and dispense protocols allows for virtually an endless variety of washer protocols. 96-well Multiscreen Filter plates (catalog number MSIPS4W10) were purchased from Millipore. Calcium and Magnesium free PBS (10X concentrate) was from Invitrogen-BRL. 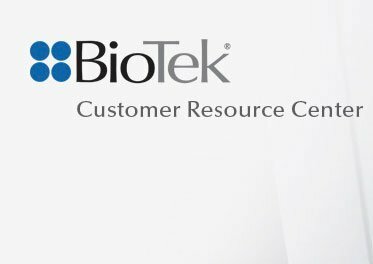 The capture (cat # 3420-3) and biotin conjugated (cat # 3420-6) mouse monoclonal anti human IFN-g antibodies were purchased from Mabtech (Mariemont, OH). Peripheral blood mononuclear cells (PBMC) were isolated previously and stored frozen (-80°C) until needed. A Multiscreen 96-well filter plate was first wetted with 70% ethanol (100 µl/well) for 10 minutes to overcome any hydrophobicity of the membrane. The wells were then washed with cold PBS (calcium and magnesium free) several times to insure that any residual ethanol had been removed. 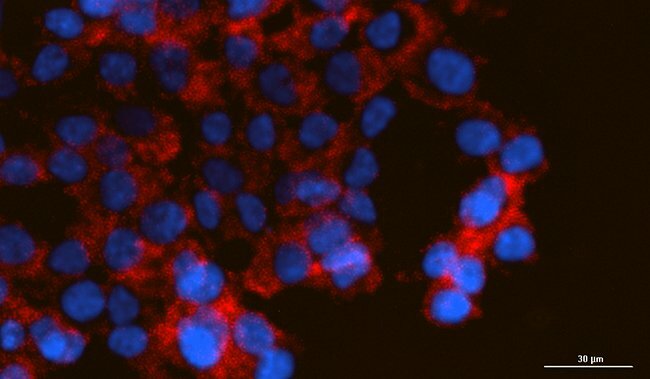 After the removal of the PBS, 80 µl of mouse anti-human IFN-gamma capture antibody, which had been previously diluted to a concentration of either 1-µg/80 µl or 0.5-µg/80 µl with PBS, was added to each well. Each antibody concentration was added to half of the plate. The plate was then covered and incubated in a humid environment overnight at 5°C. The following day, unbound capture antibody was removed and the plate washed one time with PBS (100 µl/well). After washing, 200 µl/well of blocking solution (10% fetal calf serum in PBS) was added and the plates were allowed to incubate at 37°C for 4 hours. 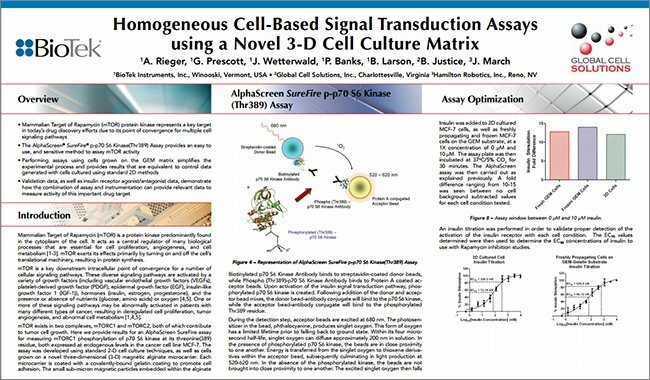 The blocking solution was removed and different numbers of PBMCs (25,000, 50,000, 100,000, and 200,000 cells/well) were pipetted into the wells in a volume of 50 µl. Additionally, there were four negative control wells which did not receive any cells. After the addition of the cells, 50 µl of either RPMI media or RPMI containing 20-µg/ml phytohemagglutinin (1µg/well) were added to each half of the plate. The plates were then placed in a CO2 incubator overnight at 37°C under humid conditions. The following morning, the plates were washed with PBS-Tween 20 (0.5%) 6 times using either a manual method or an ELx405™ Select CW washer (BioTek Instruments, Winooski, VT) with 300 µl of buffer per cycle. See Table 1 for washer parameter settings. Note that the plate was washed 3 times in the plate washer in one orientation, the plate was then rotated 180 degrees and washed another three times. The secondary antibody (biotin conjugated-monoclonal mouse anti-human IFN-g) was then added. The secondary antibody had been previously diluted in PBS-Tween (0.5%)-BSA (1%) such that half the wells received 0.5 µg/well and the other half received (0.25 µg/well) in a volume of 80 µl. The plates were then incubated at 37°C under humid conditions for 2 hours. After the incubation, plates were washed 3 times (300 µl per cycle) with PBS-Tween 0.5% either manually or with an ELx405 Select CW, followed by the addition of 80 µl of streptavidin-alkaline phosphatase conjugate, which had been previously diluted 1:1000 with PBS-Tween 0.5%. After the addition of the conjugate, the plates were incubated again at ambient temperature for 2 hours. Unbound conjugate was removed by washing again (manual and automated) 3 times with 300 µl of PBS-Tween 0.5% per cycle and 100 µl of NBT/BCIP (Pierce Chemical) was added and color developed. Color development was performed at ambient temperature in the dark for 30 minutes, after which the reaction stopped by rinsing with deionized water. Plates were then dried and analyzed on a CTL ELISPOT analyzer. Figures 2A and 2B depict the typical results obtained using ELISPOT with automated and manual wash procedures respectively. In both cases, unstimulated cells exhibit very little secretion of INF-g antibodies as measured by ELISPOT spot counts, regardless of the number of cells plated initially. 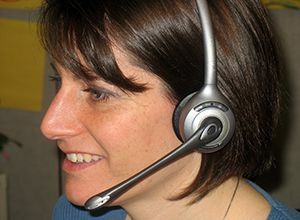 With lower cell numbers, virtually no spots were observed in unstimulated cells, while stimulation of cells with PHA results in considerably more observed spots (Figure 3). This is consistent regardless of whether the plates were washed manually or with an ELx405. In experiments where cells were stimulated with PHA secretion of INF-g antibodies, as measured by ELISPOT, spots are observed. The number of counted spots is directly proportional to the number of cells plated originally, indicating that these spots are not the result of poor washing technique (manual or automated). In addition, the number of counted spots for the ELx405 washed wells were almost identical to the number of spots returned when the plate was washed manually (Figure 4). Regardless of the condition, the automated wash procedure results in very similar results as observed with a manual wash.
Table 1. 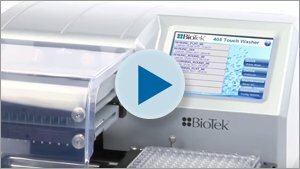 ELx405™ Select Microplate Washer settings for ELISPOT washing. Figure 2. Representative ELISPOT Wells Using Automated and Manual Wash Procedures for ELISPOT washing steps. Images and spot counts generated using a CTL ELISPOT reader from plates washed with a (A) ELx405™ Microplate Washer or (B) manually. Top three wells of each image depict unstimulated cells, while the bottom three depict PHA stimulated cells. Figure 3. Comparison of Stimulated and Unstimulated PBMCs. PBMCs that were either unstimulated or stimulated with PHA were compared using ELISPOT assays. 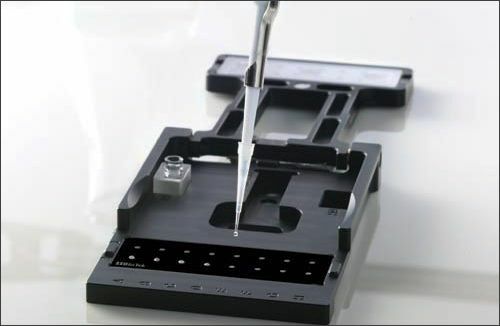 Plates were washed either manually or with an ELx405™ Automated Microplate Washer. Data was plotted using Microsoft® Excel® and the results compared. Figure 4. 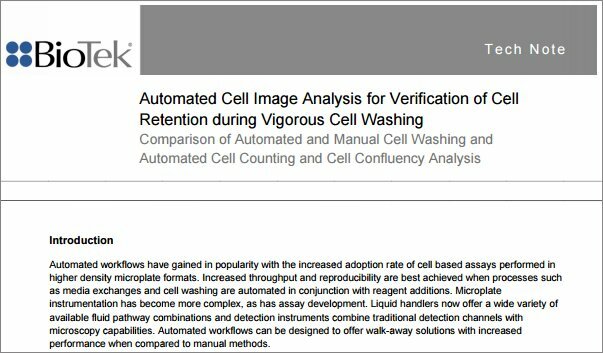 Comparison of Manual and Automated Plate Washing in Stimulated PBMCs. ELISPOT data generated from different numbers of PBMCs stimulated with PHA and washed using a manual method or with an ELx405™ 96-well Microplate Washer. Data was plotted using Microsoft® Excel® and a 2nd order Polynomial linear regression analysis performed. 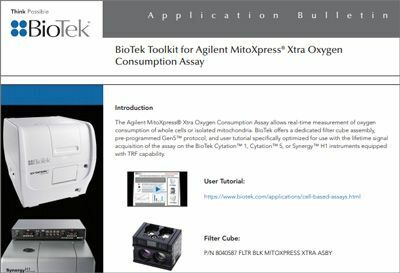 In these experiments, the stimulated secretion of the glycoprotein interferon-Γ (IFN-Γ) was examined under controlled circumstances to assess the ability of the ELx405™ washer to perform the tasks of washing the 96-well membrane ELISPOT assay plate. 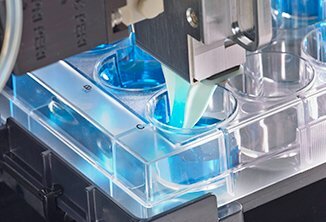 These data demonstrate that the ELx405™ Automated Microplate Washer is a viable alternative to manual washing of ELISPOT plates. 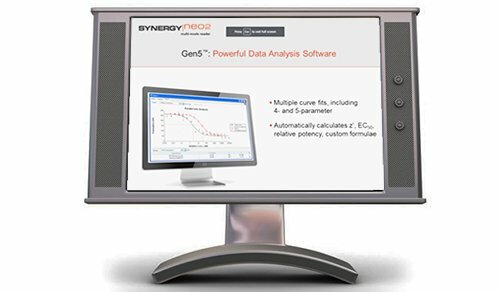 There are many parameters that need to be adjusted for optimal ELISPOT performance. These include primary and secondary antibody concentrations, incubation times and temperatures, wash buffer constituents, as well as color development time. Once these parameters have been optimized, consistent washing is required for repeatable results. In these experiments, both manual and automated wash procedures were employed with equivalent results. 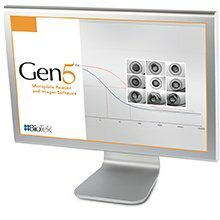 The predominant use of membranes rather than plastic for ELISPOT assays is driven by their ability to retain significantly more capture antibodies, which in turn leads to better spot staining. Unfortunately, the adhesive properties of the membrane towards antibodies also result in adhesion of cells and other debris, making them difficult to remove. Residual adhered cells may be stained nonspecifically, resulting in a background that covers the entire surface, or be stained like spots, with the potential to be confused with specific spots. Proper effective washing is a must . Use of the ELx405 washer allows for the automation of one of the more tedious tasks of the ELISPOT assay. 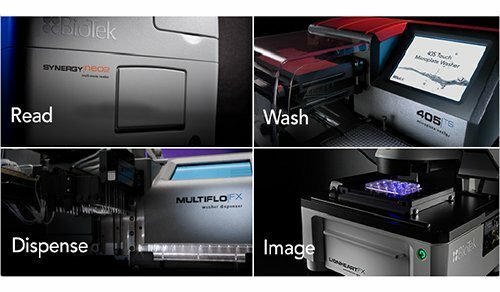 As with any automated device, the ELx405 washer provides a consistent wash technique regardless of the time of day or the number of plates processed, whereas a manual wash method is prone to inter and intra user variability. The key to configuring the ELx405 is to insure that the aspiration tubes do not physically touch the surface of the plate membrane. While touching the membrane has the potential to puncture the membrane, the usual result is the production of artifactual signal when the color is developed. These spots make proper analysis more difficult, if not impossible. We are greatly indebted to Dr. Ramu A. Subbramanian, Kristen Emerson, Michele Neace, and Dr. Mohamed T. Shata. All of these experiments took place at the Cincinnati Children’s Hospital Medical Center, Department of Pediatrics, Infectious Diseases (Cincinnati, OH). Dr. Subbramanian arranged and coordinated the experiments in his laboratory. Kristen Emerson and Michele Neace performed the ELISPOT experiments including plate preparation, cell plating, as well as manual wash procedures. Dr. Shata provided the use of a CTL Automated ELISPOT analyzer, as well as experimental and technical advice. Kouwenhoven, M., V. Özenci, N. Teleshova, Y. Hussein, Y. Huang, A. Eusebio, and H. Link (2001) Enzyme-Linked Immunospot Assays Provide a Sensitive Tool for Detection of Cytokine Secretion by Monocytes. Clinical and Diagnostic Laboratory Immunology 8(6):1248-1257. Handbook of ELISPOT. Methods and Protocols, (2005) Alexander E. Kalyuzhny Ed. Humana Press, Totowa, NJ.